For nearly 50 years, a small fleet of PCC cars carried passengers along the Newark City Subway, the last operation remaining in New Jersey from the heyday of the trolley. One car, #6, was cosmetically restored to its 1954 appearance shortly before retirement in 2001 and was set aside for preservation. Now, after waiting for nearly a decade for preservation, the Rockhill Trolley Museum has a unique opportunity to acquire and preserve this outstanding example of a PCC car which retains most of its original features, including crank-operated windows, window guards, armrests, foot rests, and an essentially as-built exterior appearance. PCC car #6 was specifically selected for preservation in 2001 as it was considered one of the three best operating cars by NJ Transit City Subway maintenance personnel. The car received new wheels approximately one year before retirement and was also the last PCC car painted before retirement. The car is standard gauge and has a backup controller, making it ideally suited to the museum’s operating conditions. Rockhill Trolley Museum is seeking donations for acquisition and transportation of the car to Rockhill Furnace, as well as to fund touch up work to improve the appearance of the vehicle before it enters the museum’s operating fleet. Barring any unforeseen conditions found during preparation of the car for operation, the museum’s goal is to have the car return to public operation this summer. 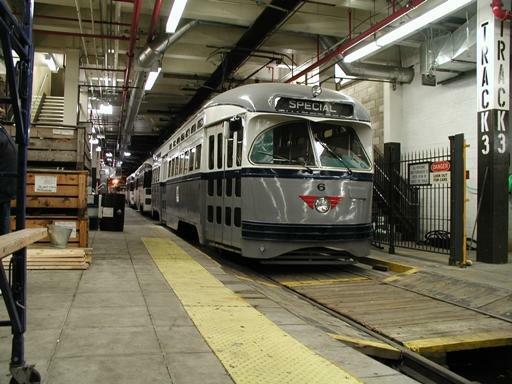 More than 2,000 PCC cars operated within 200 miles of Rockhill Trolley Museum. Please help us preserve this very special PCC car for the education and enjoyment of future generations.